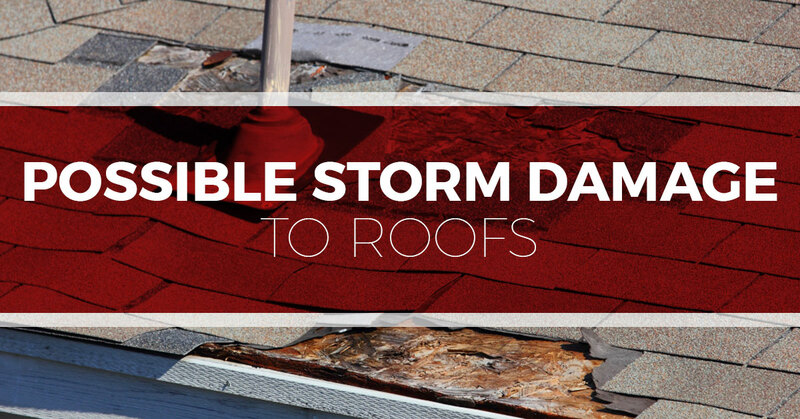 If your home was hit by the strong storms that rolled through in late April, your roof might have sustained damage that you are unaware of. You may have rightly been more concerned with your family’s safety, your trees, or your car. The roof was still on, so let it go. But if you let damage go there could be unintended consequences. In this week’s blog, we’ll take a closer look at storm damage, how to detect it, and why you should repair it sooner rather than later. We are Tim Leeper Roofing and are experts in both commercial and residential roofing. We offer repairs and replacements for pitched and flat roofs. The storms that blow over the Highland Rim and into the Central Basin can be powerful and contain strong winds and torrential downpours of rain and hail. These forces of nature can cause enough damage to roofs that they’ll need replacement. The winds, like the straight-line winds that knocked over adult trees in Franklin, can pull up the corners of the roof or rip off the flashing. This is damage you might not notice at first as you drive up to your house and pull into the garage, never thinking to look at the roof. Strong winds can also blow branches off of trees and blow whole trees down, so if this happens the damage is often not subtle. Torrential downpours of rain can damage your roof, too, though in much less dramatic ways than window or hail. The power of rain can knock off the granules from the surface of the asphalt shingles of your roof. The granules are not merely cosmetic. They function to protect the surface of the shingle from UV rays and other forces of nature. When a shingle has too few granules, the shingle can’t do its job, and leaks are more likely. Hail is a well-known factor in damage after a storm. Hail, especially large hail, but also small sustained hail, can knock off granules at a rate that can ruin a roof in a matter of minutes. The hail stones can make a solid impact on the roof shingles and even rip or sheer off parts of shingles, increasing the chances of a leak. If your home was hit by a storm, there are a few things you can look for before calling a professional roofer for an inspection. Look around your yard for shingles—either whole or partial shingles are a sign of roof damage. If all the tree leaves are now on the ground, take a photo so you can prove to the insurance company that it was indeed hail that hit your home. Flashing is often blown off by winds that accompany a hailstorm, so look for pieces of loose metal lying around the yard. If you find a large branch on the ground and suspect that it made an impact on the roof as it made its way to the ground, call for an inspection. Only look from the ground. Always let a professional be the one to get up on the roof to inspect for damage. They know what to look for and know how to be safe. If a hail storm passed over, try to get photos of the hail, with something to act as a size reference. Look at the ground level of your home and yard for signs of hail damage. Is your glass patio table shattered? Are there dings and dents in your heat pump casing? Are there shattered flower pots? If you see any of these signs, the hail stones that fell were likely to have also caused damage to your roof. If your roof has sustained damage from a storm, it is best to get it professionally inspected to see if there is damage that needs to be repaired. There are two main reasons to act quickly. The first is that if your roof has substantial damage, some of which you may not be aware of without a professional inspection, it can lead to a leak. Even a small leak can ruin insulation, rendering it less efficient, and can cause damage to the wooden structure of your home. The beams that hold up your house could be subject to water damage, and if they also need to be replaced, the costs will be significantly higher than just repairing the roof. The second reason to act quickly is to take advantage of your homeowner’s insurance. If you have damage from a storm, it is important to make your insurance claim quickly. This enables roofing contractors to inspect the roof, gather timely evidence (photos of hailstones, etc. ), and help you with the claim so you can get your roof replaced or repaired before leaks occur. Call us today if you suspect that your roof sustained damage from a recent storm. We’ll come out, inspect it, and if it needs replacement, we can work directly with your insurance company, making the process fast and worry-free.